Originally posted at Edutopia. Written by Andrew Marcinek. Over the past two days, I have had the opportunity to visit nearly 300 classrooms at Grafton Public Schools. As I walk through classrooms to ensure that all technology pieces are working effectively and efficiently, I notice the way classroom management is happening. The one consistent element across grades K-12 is that active learning is taking place — I notice all students involved or engaged in an activity. Occasionally, there is technology involved as well. But the key element in classroom management, whether using technology or not, is to ensure that students are actively participating in the learning process, not simply receiving it. How will the technology or application I’m integrating help students grow in their learning? How will the technology or application help them achieve their goals? What is the comfort level for integrating the technology or application? 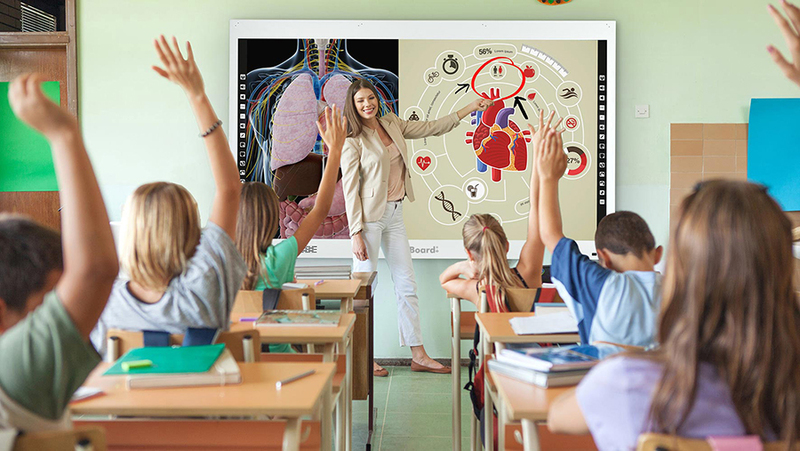 Once you’ve designed a lesson or project that will include students as active creators of their learning, it’s time to think about what role technology will play in this lesson. Technology should always support and reinforce the learning that is taking place, never precede it. Beyond ensuring that your students are actively learning or creating to meet certain goals or objectives, the key with technology is making sure that your technology use is organized, and that you’re ready to use it. And, as we all know too well, technology will sometimes present a minor glitch. That’s why it’s always important to have Plan B ready to go, possibly an analog version of your scheduled activity, in order to keep the pace of the class and keep the lesson on task. So that’s one of the first steps in successfully integrating technology into your classroom: have a backup plan ready. Without a plan to seamlessly transition from a digitally-infused lesson to an analog lesson, your class will surely descend into chaos. I am not sure I want to move all the content I’ve built in Edmodo into Google Classroom. Edmodo is working well for me and our department. Well, you don’t have to. If you use an app like Edmodo that works for both you and your students, then stay the course. Just because Google Classroom is new and everyone (including myself) is blabbering about it on Twitter and Google+, that doesn’t mean it’s better than Edmodo, Schoology, Google Sites, or whatever application or program is working for you and your students. The key is to find something that meets your comfort level and the needs of your students, your curriculum standards, and your goals. If you switch apps and technology too frequently and too quickly, students will be confused, and you’ll spend too much time setting them up on new systems and missing out on valuable active learning time. The other piece is that students will inevitably be distracted by something. This could be a window, the ceiling, or an app. Depending on the grade level, these distractions will come in different durations and at different times of day. Technology doesn’t have to increase or create distractions in the classroom, but if used without a purpose, it most likely will. When you’re integrating technology, you want to make sure that it aligns with the learning goals and ultimately helps students reach those goals. I’ve always stressed that successful technology integration hinges upon a healthy balance of online time and offline time. When balanced well, students can achieve great things, stay focused, and move toward their ultimate goal. As with anything, the key to quality classroom management is to have a plan, a Plan B, and to ensure that technology integration is consistent, clear, and supports the learning objectives and goals. Make sure that your class time includes an active learning and creating piece that will yield student engagement. Teachers will never be able to control it all, but they can put steps in place to limit the uncontrollable. If you follow the pieces listed above, managing a technologically equipped classroom should be a great experience.